Looking to accelerate your competitive edge and leadership via social media? Consider the impact and reach of multi-channel video to establish a meaningful “content rich” relationship with the providers and influencers that are the foundation (and future) of your brand. Dramatic Health has taken its publisher mindset and journalistic approach to video marketing and created a new model for video content creation. This Just in Time partnership can capture, edit, get approval and deliver smart and engaging short videos in rapid fashion. Starting with a video assignment, our medical writer develops a customized interview guide. We leverage that for quick capture interviews of pre-established HCPs and experts. From there it’s a 12 hour turnaround to a first edit, ready for posting a rough for MLR review/approval. Final edit follows, and (as needed) handoff to an existing AOR. (In parallel, there’s also the potential for b-roll capture to round out the production value and narrative.) 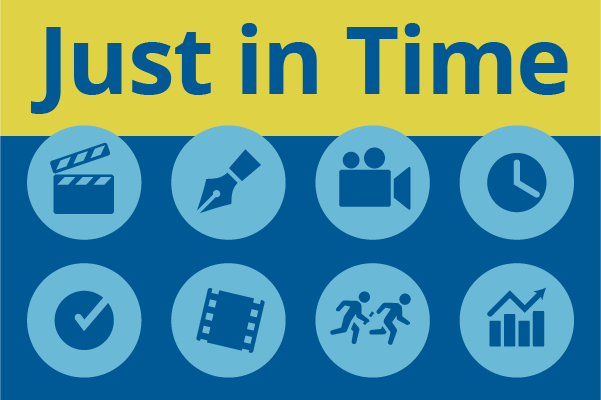 Depending on the client and client needs, the Just in Time timeline can be adjusted between 48 hours and a 1 week turnaround. We call Just in Time a partnership because it does require pre-planning for the right systems and people to be in place. But with that process comes timely, focused communication in the form of compelling social content that can truly matter to raising awareness and prescribing behaviors. Dramatic Health’s results are unprecedented because health video is our sole focus and passion. Let’s get started focusing on your brand. To find out how a Just in Time solution can work for you, contact Sean Moloney, CEO & Co-Founder, at 908-432-9604.